xiv, 208 p. ; 22 cm. Reveals the ingenuity and people-driven philosophies that have made Starbucks one of the world&apos;s most recognized and admired companies. 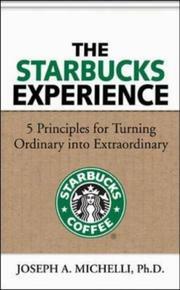 The Starbucks experience : 5 principles for turning ordinary into extraordinary / Joseph A. Michelli. Success in business--Handbooks, manuals, etc. $c Statement of responsibility Joseph A. Michelli. 505 ContentsNote 0 $a Formatted contents note Introduction -- Principle 1- make it your own -- Principle 2- everything matters -- Principle 3- surprise and delight -- Principle 4- embrace resistance -- Principle 5- leave your mark -- A final word. 520 Summary Etc. $a Summary, etc. note Reveals the ingenuity and people-driven philosophies that have made Starbucks one of the world&apos;s most recognized and admired companies. 610 AE:CorpName 20 $a Name Starbucks Coffee Company. 610 AE:CorpName 27 $a Name Starbucks Coffee Company.